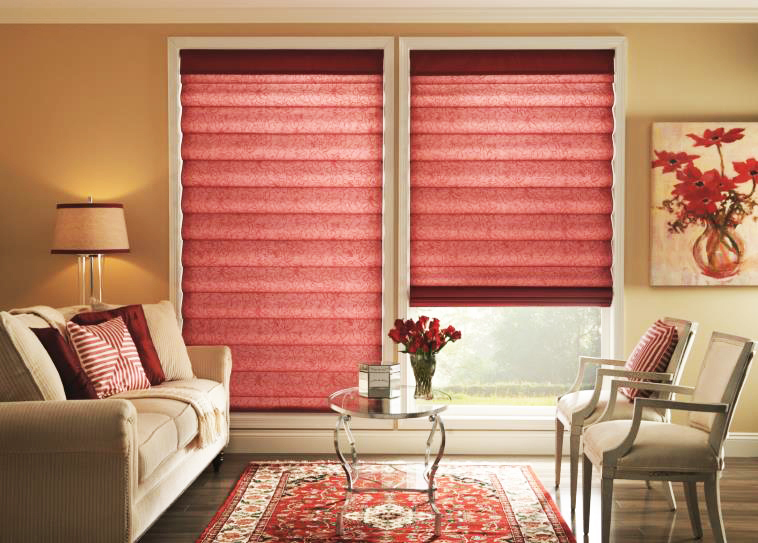 Blinds and shades do not get the attention they deserve from most homeowners. They believe that people will not notice their window shades but this is not true. Classy roman shades are a great feature which speaks volumes about the design and style of your rooms. You will find that roman shades are very practical and simple treatments for your windows that will provide a great accent for your rooms. Also they will provide protection from the rays of the sun and give you that much deserved privacy from prying eyes. Yes there are plastic blinds available, but these often look cheap and nasty. The fabric of a roman shade mounts on the window, and there are fabric pleats that will fold at regular intervals when you pull up the blind. Compared to ornate blinds and shades roman shades require less fabric. They are also cheaper than their ornate cousins. The roman blind has been around for hundreds of years and there are many options open to you when it comes to color shades and style options. There are contemporary styles of roman shades now which are very popular. All roman shades have a pull cord for the raising and lowering of the shades. They are a truly wonderful addition to any room and they look beautiful. Lightproof material is used with a lot of roman shades. What this does is reduce the amount of sunlight that enters your room very efficiently. If too much sunlight enters a room then it will quickly heat up fast. In summer months when you are running your air conditioning your system will have to work harder to counteract the additional heating effect of the sunlight. This will result in your energy costs being higher. In winter time you can save money too as a roman shade is a very good insulator. The material is heavy and therefore does a very effective job of keeping the heat in your home. This is a very simple solution to saving on your energy bills. Don’t just consider functionality when choosing the material for your roman shades. When you do this you will have an almost endless array of choices. It is possible to create a roman shade from just about any kind of fabric pattern. You can really make a statement with your windows. If you require the functionality of insulation or light proofing then there is still a wide range of options available. In fact you can choose to have your shades created using multiple fabrics that combine style with functionality. What kind of style are you looking for? You could go for a casual look and have shades that form a loose bundle when pulled up. Alternatively there are the more modern styles that provide a really neat look. Wood slats provide internal support for these shades and these will stack very neatly when collapsed. You can have roman shades in your bathroom, your dining room, your bedrooms in fact just about any room in your home will benefit from these shades. They are an elegant yet simple way to cover your windows and the added functionality of light proofing and insulation makes them a very attractive proposition. These shades will never go out of style – they have been around for centuries and are truly timeless. Aluminum blinds and plastic blinds just don’t compare. So have roman shades installed in your home now – you will never regret it.